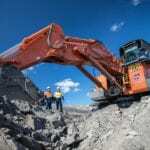 National Group has started 2019 in the same way it finished a record-breaking 2018 for the company by delivering a pair of excavators into Queensland’s Bowen Basin. 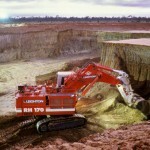 BHP Billiton Mitsubishi Alliance (BMA) added the first of these excavators, a Hitachi EX5600, to the Peak Downs mine. National Group also delivered five Liebherr ultra-class T 282C trucks to Peak Downs last September. The second excavator, a Liebherr R 996B, was delivered to the Poitrel mine, part of the BHP Mitsui Coal (BMC) joint venture. It is the first piece of equipment National Group has supplied to Poitrel. National Group founder and managing director Mark Ackroyd said the delivery of the excavators contributed to an already strong relationship with BHP. “We have been working with BHP for some time now, especially at Peak Downs, so to be adding more equipment there is a testament to the machines we currently have operating for them and speaks volumes of our team on-site who do a great job with maintenance when needed,” Ackroyd said. National Group used its unique capabilities to handle all transport – assembly and delivery – to overcome the complex process of bringing the equipment to Australia. Ackroyd said National Group knew how difficult it could be to get the bigger gear to Australia first of all, let alone having to worry about everything else once it arrived. “That is why we have worked very hard to build brands that complement each other in the entire journey of port-to-pit,” Ackroyd said. National Group, coming off one of its best years to date, has set future plans to invest in technology and enter the automation space. “The mining industry is now following the technology trend around the world and automation is at the forefront of this,” Ackroyd said.